Sen. Bernie Sanders chats with supporters during a visit to his Iowa campaign headquarters in Des Moines, Iowa, in June. Hillary Clinton must be having déjà vu. She once again finds herself struggling in the Iowa caucuses due to a potential influx of first-time caucus-goers. Clinton’s lead over Bernie Sanders in Iowa shrunk to only 2 percentage points in last week’s Des Moines Register poll (Sanders is leading in a CNN survey released Thursday), and she is only a slight favorite according to FiveThirtyEight’s polls-only forecast. Voters who say they will “definitely caucus” favor Clinton 45 percent to 36 percent over Sanders, but Iowa Democrats who say they will “probably caucus” favor Sanders by a margin of 47 percent to 37 percent. If Bernie Sanders hopes to pull off this upset, he will need those “probable” caucus-goers to turn out near 2008’s historic levels, when turnout in the Democratic caucuses (235,000) almost doubled 2004’s (125,000). Barack Obama’s Iowa organization in 2008 — 37 field offices in 34 of Iowa’s 99 counties — is the stuff of political legend. Former campaign manager David Axelrod said last week that he believes Obama “would not have won in ’08 without it.” While Axelrod is probably overstating their impact, given Obama’s 8-percentage-point margin of victory in Iowa, field offices have been shown to help candidates win close elections. Field staffers conduct the tasks that lead to increased turnout, such as training volunteers and coordinating get-out-the-vote activities. If the Iowa caucuses end up as close as polls currently show, Sanders’s hopes in Iowa may hinge on his ability to follow Obama’s 2008 turnout blueprint, raising the question: How does his ground game compare to Obama’s? Sanders has not organized as thoroughly as Obama did: The Vermont senator’s 23 field offices in Iowa do not quite measure up to Obama’s 37 (or surpass Clinton’s 26 offices this year). Sanders, like Obama, seems to be focusing resources on heavily populated, Democratic-leaning counties in order to “run up the score” in friendly areas of the state. These counties1 voted, on average, 56.2 percent for Obama in the 2008 general election and contain an average population of over 104,000, according to the 2014 American Community Survey, making them some of Iowa’s most populous counties. 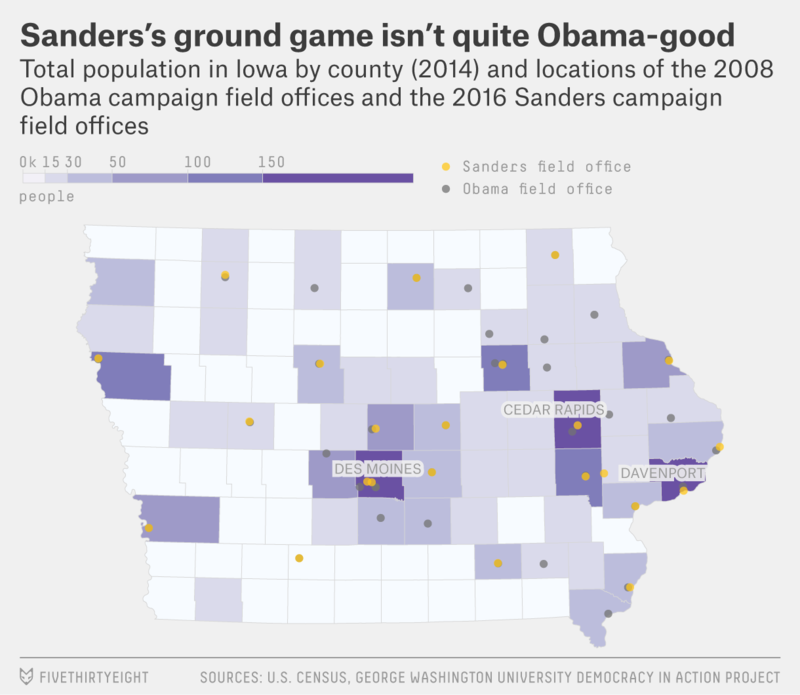 But in 2008, Obama also had field offices in 13 counties2 where Sanders has not invested today. These counties are much smaller — averaging about 27,000 residents — but only slightly less Democratic, giving Obama 54.5 percent in the 2008 general election. In 2016, not having a nearby Sanders field office reduces these Iowans’ probability of direct personal contact from Sanders volunteers — the most effective tool a campaign has for changing minds and mobilizing voters. By neglecting to invest in these areas, Sanders may be leaving votes on the table in an election where every vote may count. Sanders’ organization does not equal Obama’s, despite his similar (if not loftier) goals for turnout and participation. In counties without paid staff and field organization, Sanders will be relying on another concept central to Obama’s 2008 run — hope — to get his winning coalition to the caucuses on Feb. 1. Counties with both Sanders 2016 and Obama 2008 field offices are Black Hawk, Carroll, Cerro Gordo, Clay, Clinton, Des Moines, Dubuque, Jasper, Johnson, Linn, Marshall, Muscatine, Polk, Pottawattamie, Scott, Story, Union, Wapello, Webster, Winneshiek, and Woodbury. Sanders 2016 has a field office in only one county that Obama 2008 did not (Cedar). Counties with Obama 2008 but no Sanders 2016 field offices are Bremer, Buchanan, Clayton, Dallas, Fayette, Floyd, Jackson, Jefferson, Jones, Kossuth, Lee, Marion and Warren.